Korea's defense ministry on Wednesday announced a plan to capitalize on big data, 3D printing, drones and other cutting-edge technologies to strengthen the military's logistical support capabilities. The plan is part of the Defense Reform 2.0 initiative aimed at creating a smaller yet smarter military capable of handling traditional and nontraditional security threats from inside and outside the peninsula. "So as to expand logistical support capabilities and efficiency, the defense ministry plans to preemptively adopt technologies related to the fourth industrial revolution," the ministry said in a press release, referring to the fast-paced industrial transformation marked by the convergence of new technologies. Harnessing big data analysis, the ministry plans to establish an integrated military logistics information system by the latter half of 2019 to replace the current fragmented structure. It believes the new system will help make more efficient predictions as to the future demand for military supplies. The ministry also seeks to utilize 3D printing to produce component parts of the old military equipment whose production lines have been closed or are difficult to maintain due to high costs and other reasons. In December last year, the defense ministry signed an arrangement with the industry ministry over the development of 3D printing technologies applicable to the defense industry. In addition, the ministry is seeking to introduce drones capable of effectively transporting food, medicine, ammunitions and other emergency supplies to remote areas during both wartime and peacetime. As an initial step, the ministry, in cooperation with the industry ministry and drone manufacturers, plans to start introducing 10 drone prototypes, which can meet military requirements, in the latter half of this year. Then, it will test the drones by 2023 and plan to expand their deployment to the Army's general outposts and other remote military units from 2024. The ministry also plans to introduce the "warrior platform," high-tech battle gear including advanced bulletproof helmets and sniper rifles, as part of efforts to maintain combat capabilities amid the prospect of a troop reduction. Meanwhile, the ministry said that it plans to reduce the number of sedans assigned to colonel- and general-grade commanders from 765 to 417 in November. 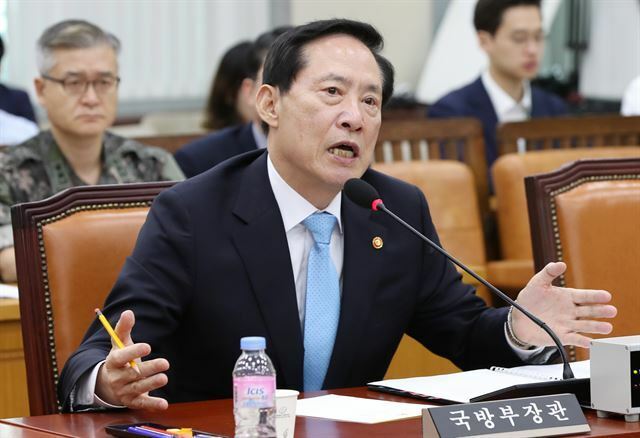 It is a step to have them "give up their sense of privilege and take the lead" in military reform efforts, the ministry said.